“I have searched the web for a good tutorial on how to use the NRF24L01 wireless transmitter and receiver but was unsuccessful. So after 2 weeks and the help of a friend I finally got it to work! I hope your experience is not as painful and confusing as mine was and this tutorial can hopefully help you get your projects working faster. 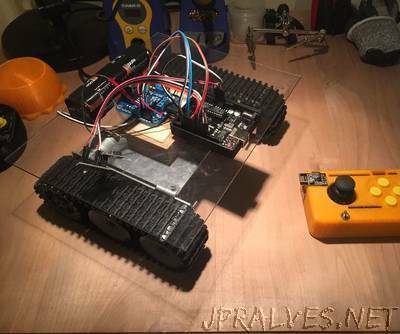 In this project I used my universal arduino controller and a robot I through together with spare parts I had sitting around. But all you really need is two arduinos and a set of NRF chips.